Valsartan Recall | Why Is the FDA Recalling Valsartan? What Should I Do if My Valsartan Is Recalled? In July 2018, the U.S. Food and Drug Administration announced a voluntary recall for valsartan blood pressure medications because they may have been tainted with N-nitrosodimethylamine (NDMA), a chemical that can cause cancer. On July 13, 2018, the U.S. Food and Drug Administration announced a voluntary recall of valsartan, a generic blood pressure medication. Manufacturers issued the valsartan recall because some lots contained a cancer-causing chemical called N-nitrosodimethylamine (NDMA). The FDA estimated that about 3 million Americans take valsartan to control blood pressure or protect their hearts. The recall affects more than half of the U.S. supply of the drug, the FDA said in an Aug. 30, 2018 statement. The agency estimated that the tainted drugs have been on the market since 2014. Not all valsartan products are included in the recall. The FDA has traced the recalled drugs to Chinese manufacturers Zhejiang Huahais and Zhejiang Tianyu as well as Hetero Labs Limited in India. The FDA’s investigation continues. In September 2018, the FDA announced it had found another toxic chemical in tainted valsartan batches called N-nitrosodiethylamine (NDEA). Like NDMA, it is a known animal and possible human carcinogen. Lawyers are filing valsartan lawsuits for people diagnosed with cancer after taking valsartan for more than a year or who had liver or kidney injuries that required an ER visit or hospitalization. 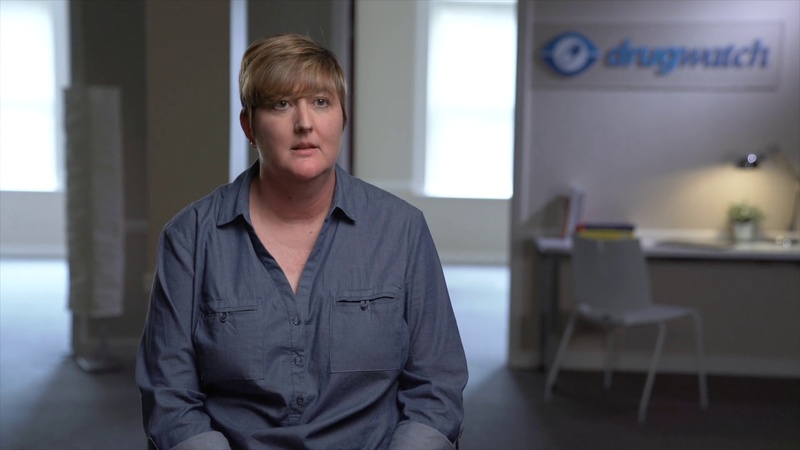 Registered Nurse Amy Keller explains why the FDA recalled valsartan. The valsartan recall includes some generic drugs that contain valsartan as the active ingredient. The recall also includes all valsartan dose-strengths from 80 to 320 milligrams. 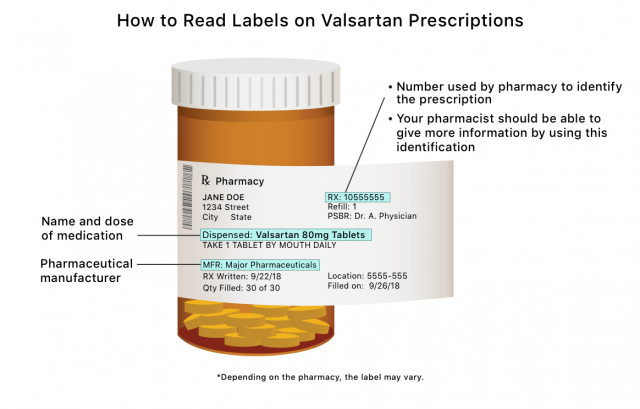 The recall does not include all valsartan products. Only specific valsartan manufacturers recalled the drug as of Aug. 27, 2018. The FDA said it will update its list as it continues to investigate. Diovan, Entresto, Exforge, Exforge HCT and Byvalson are not included in the valsartan recall. Hetero Labs, Inc. labeled as Camber Pharmaceuticals Inc.
Have Other Blood Pressure Drugs Been Recalled? Other generic blood pressure drugs such as lisinopril (Zestril or Prinivil), losartan (Cozaar) and olmesartan (Benicar) are not included in the valsartan recall. Losartan and olemesartan belong to the same class of blood pressure drugs, angiotensin II receptor blockers, as valsartan. The FDA is investigating the class of drugs for possible NDMA contamination but has not reached any conclusions. Anyone taking valsartan or a combination drug including valsartan should check the label on the prescription bottle or the warning insert that accompanies the medication. It should contain the name of the manufacturer. Check the recall list to find out if your manufacturer is on it. The FDA also uses a National Drug Code to track products. The FDA lists the NDC codes for all recalled valsartan products. Normally, your prescription bottle from the pharmacy will not contain this information. Your pharmacist should be able to check these codes for you. If your valsartan manufacturer is a part of the recall, do not stop taking your medication. Suddenly stopping your medication may lead to health problems. First, talk to your doctor about your treatment options. Next, check the FDA’s Drug Recalls website and search for your drug’s manufacturer. Some manufacturers provide guidance in the event of a medication recall. For example, Torrent Pharmaceuticals Limited lists all the lots and products included in its recall. It also provides contact information and instructions for patients. Don’t throw away your medication until you have your new medication. Your pharmacist can offer instructions for disposing of old medication. What should people do if their valsartan was recalled? Registered Nurse Amy Keller explains what you can do if your valsartan was recalled. Several blood pressure drugs may be a suitable alternative to valsartan. There are drugs in the same class as valsartan, and they work the same way. You may also be able to get valsartan from a manufacturer that is not on the recall list. Ask your doctor about your treatment options. Each of these medications has its own risks or side effects. The FDA recalled some valsartan products because it found traces of NDMA, a chemical that can cause tumors in animals and may cause cancer in humans. Cancer is not a typical valsartan side effect. “We estimated that if 8,000 people took the highest valsartan dose (320 mg) from NDMA-affected medicines daily for four years (the amount of time we believed the affected products had been on the U.S. market), there may be one additional case of cancer over the lifetimes of these 8,000 people beyond the average cancer rate among Americans,” FDA Commissioner Scott Gottlieb said in a statement. In some studies, researchers found a positive link between NDMA intake and gastric and colorectal cancer, according to Health Canada’s Guidelines for Canadian Drinking Water Quality, released in 2011.